At 10,000', Grand Mesa is one of the largest flattop mountain in the world rising more than a mile above the valley floor and stretching over 40 miles of Colorado's landscape. The entire area is a focal point of back roads and trails leading into the wilderness. 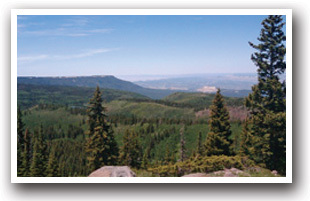 The Ute Indians called the Grand Mesa "Thunder Mountain" because of how the mesa towers over the valley 6,000' below. Escape the summer heat and relax in Grand Mesa's cool mountain air. Hikers will want to trek along the Crag Crest National Recreation Trail, a 10-mile circle that is only open to foot traffic. 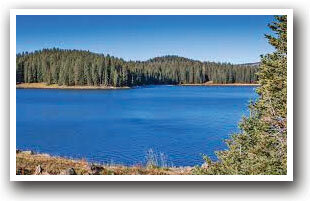 Discover over 300 lakes offering fantastic fishing. Rainbow, brook, and brown trout like to roam these waters. Some lakes have boat launches accessible via Highway 65; for the more adventurous anglers, visit one of the many lakes only accessible by 4WD vehicles/ATV, foot, or horseback. The town of Cedaredge is a 19th-century Western village. It has a blacksmith shop, jail, saloon, schoolhouse, and a frontier museum. Experience the American West at the turn of the century. Cedaredge also hosts the annual AppleFest with activities including a scarecrow contest, wine and beer garden, the Golden Gala, and an antique tractor show. 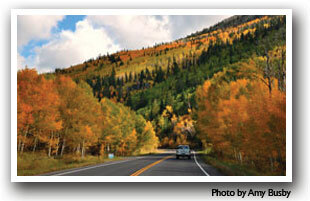 Drive the Grand Mesa Scenic and Historic Byway and tour the changing aspen in the fall. Travel through Austin, Cedaredge, Collbran, Eckert, and Mesa to view various scenery changes; start in a desert canyon, and pass aspen foothills, lakes, alpine forests, lily ponds, and meadows bursting with wildflowers as you make your way to the top of the mesa. The byway provides many scenic overlooks to view each of these wonders. Almost entirely within the Grand Mesa National Forest, Grand Mesa has abundant wildlife making this a popular area for fall hunting. Stay in a Cabin/Cottage, Motel/Hotel, RV Park, Lodge Room, or Tent Site. 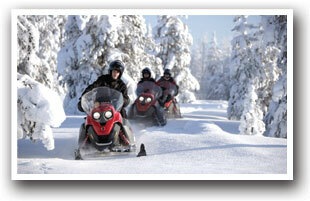 The winter months bring many skiers to the Powderhorn Resort only 35 miles southeast of Grand Junction. The forested top of the mesa remains snowbound much later in the spring than the surrounding valleys, and is a popular location for cross-country skiing and snowmobiling. Annual events in the area include a sled dog race/skijoring competition, golf tournaments, the Little Britches Rodeo, and the Parade of Lights.